Nasatka’s versatile mobile barriers can be deployed and operational in 12 minutes, protecting targeted facilities, entry control points or special events. There is no surface, footing or barrier anchoring preparation required. This barrier makes it easier for teams to adjust entry and exit plans as the situation changes or warrants. Manual operation of Nasatka mobile barriers can be performed by one person using a spring-assisted lever bar. Automated operation is provided by either battery or standard power. Battery charging options include solar, generator or standard power. Over 1,500 units of the NMSB-XV 12 ft. mobile barrier have been deployed worldwide, since 2003. Nasatka mobile barriers are U.S. 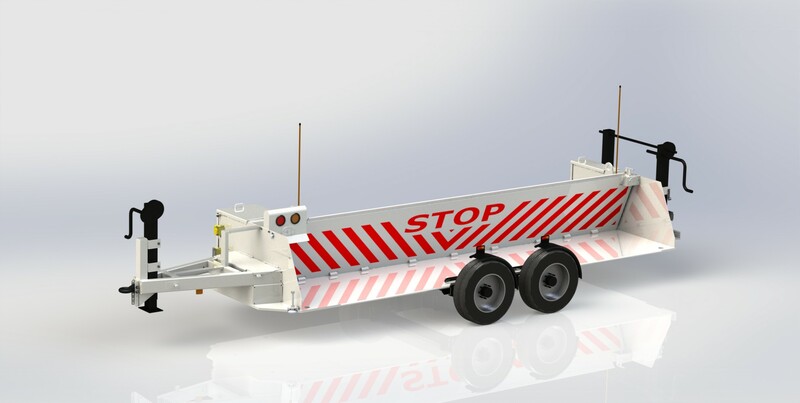 DOT approved and can be towed to deployment locations with a standard pick-up truck or military vehicle with an optional military tow hitch package. Two to three personal or helicopter airlifts can transport these barriers to any desired location. Manual operation does not require hydraulic assistance. Based on the changing terrorist threat, you can enhance security at vehicle checkpoints, move vehicle checkpoints, or control traffic inside or outside of previously non-secure or already secure perimeters. You can quickly create vehicle access/egress points where needed, whether on a private or public road. Likewise, within minutes of a decision to “Step-Down”, you can easily move Nasatka’s mobile barriers to a storage area or new locations for setup. In addition to using these barriers to thwart car & truck bomb attacks against targeted facilities, you can use them to support evacuation plans, secure disaster scenes, maintain quarantine or control traffic at large public events.